These days, everyone of us mostly uses recycle bags when we go shopping for plastic bags are banned in most cities already. There are many bags that we can use like bags made of cloth and those water-resistant bags are very popular to use because it’s not just water repellent but also can be fold into small shape and it’s lightweight. Carrying them inside the bag is not a hassle. Now, you can order Personalized recycle bags at artscow, wherein you can easily put your name, logo and even your own photos. Perfect for personal use, as gifts to love ones and even give-away for any occasion. But if you are looking for a bag that can carry you instruments, you'll find this cajon bag from musicians friend to be helpful. 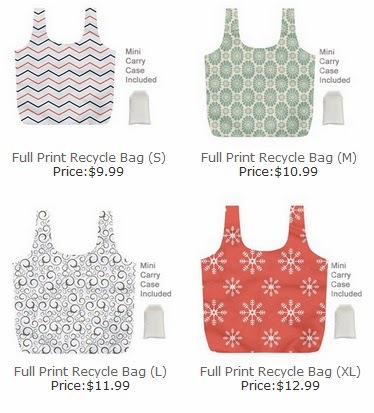 Here are some recycle bag templates that I made for Arstcow. The small (S) one can be ordered for $9.99, for $10.99, L- 11.99 and XL for $12.99. These templates are easy to use, just drag and drop your photos and you can even put your own text on them too.